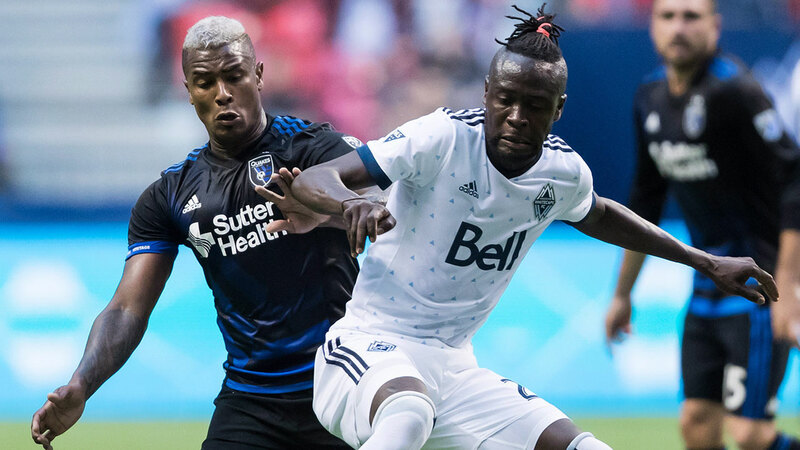 VANCOUVER — Forward Jordy Reyna scored one goal and assisted on another by Cristian Techera as the Vancouver Whitecaps battled back from one goal down for a 2-2 Major League Soccer draw with the San Jose Earthquakes on Wednesday night. Striker Danny Hoesen, on a disputed play, and defender Nick Lima scored for San Jose. The Whitecaps (4-5-3) are 1-4-2 in their last seven games. The Earthquakes (2-5-3) have one win in their last nine games (1-5-3). Brian Rowe started his second consecutive game for Vancouver with usual starting goalkeeper Stefan Marinovic out with a sprained knee. Lima put the Earthquakes ahead 2-1 in the 53rd minute. The Whitecaps gave too much space to midfielder Valeri Qazaishvili, allowing him to dribble into Vancouver territory. He dished off to Lima who scored his first goal of the year on a bending shot. Reyna tied the match in the 64th minute. Left back Marcel de Jong sent a long ball into the box. Reyna headed a shot that bounced off the back of San Jose defender Shea Salinas, a former Whitecap, and past Earthquakes goalkeeper Andrew Tarbell. Hoesen tied the game in the first minute of first-half injury time. The Netherlands native got behind the Whitecaps’ defence, took a long pass from Florian Jungwirth, and lifted a shot over Rowe for his team-leading fifth goal of the season. The crowd of 17,357 at BC Place Stadium booed loudly as the Whitecaps argued the play was offside. Video replays showed it was a close call. The teams exchanged early chances. In the fourth minute Reyna sprinted into the clear but his right-footed shot from inside the box went wide. Just a minute later Earthquake forward Magnus Eriksson took a cross from Lima and headed a shot that was just wide. Vancouver defender Kendall Waston made a nice play in the 15th minute knocking a ball out of bounds before Qazaishvili could get a shot off. Tarbell had to look sharp in the 27th minute, making a diving save off a long shot from de Jong. Late in the half he swatted away a Waston header. The Whitecaps leave Thursday to play FC Dallas Saturday. NOTES: Waston, who was named to the Costa Rican World Cup team earlier this week, made his 100th MLS regular-season appearance and 99th start. â€¦ The Whitecaps used a 4-4-2 formation for the third consecutive match. â€¦. De Jong signed a contract extension Tuesday through 2019 with an option for 2020. â€¦ San Jose forward Chris Wondolowski didn’t start for the third time this season.